For anyone who follows the England cricket team, the talk about their current captain, Alastair Cook, is pretty much unavoidable. The successor to the pretty successful Andrew Strauss, he was always going to have to tough act to follow but, initially, it seemed to be going well. He avoided a potential banana skin in Bangladesh in Feb/Mar 2010 (scoring plenty of runs in the process) whilst deputising for the rested Strauss and started well by leading the side to 2-1 series win in India (again scoring heavily) in 1012/13 in the first series after Strauss retired. Sadly for both Cook and England that has proved to be the high point of his reign (a 3-0 win in the Ashes in 2013 not withstanding). Since the end of the 2013 Ashes series England have lost 5-0 to Australia in Australia*, 1-0 to Sri Lanka and look likely to finish second in the current India series. His personal stats with the bat are no less grim: 277 runs @ 27.70 in Ashes 2013, 246 @ 24.60 in Ashes 2013/14, 78 @ 19.50 against Sri Lanka and, so far, 15 @ 7.50 against India. Against this there is also the continuing fallout of the 2013/14 Ashes whitewash to consider. Those who know the full story aren’t telling which leaves everyone else speculating. All we know for sure is that the England management called time on Kevin Pietersen’s international career shortly after the team returned from Australia. 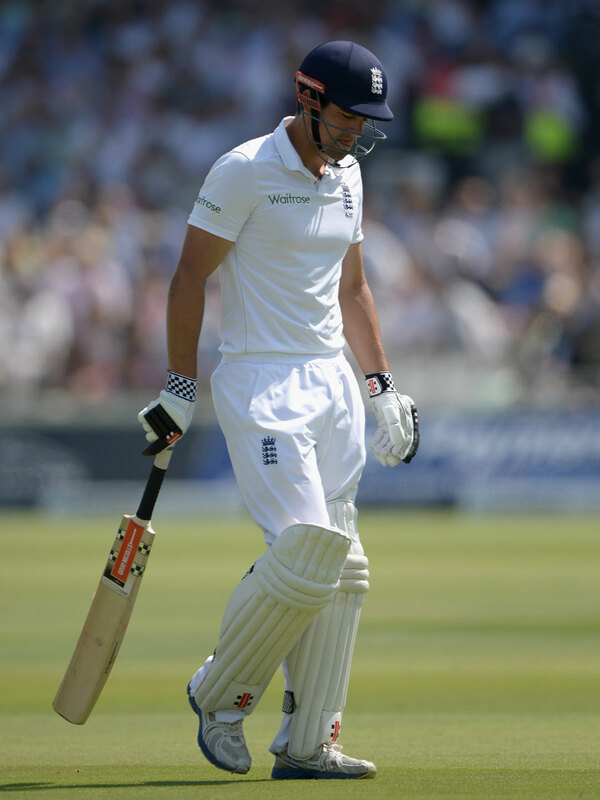 There is no doubt that KP, on his day, was a brilliantly destructive batsman. However it is also not in doubt that he has fallen out with many of the teams he has played for (Nottinghamshire, Hampshire and England being three obvious examples). Strauss may have been an idiot for calling him a complete c*** on an open microphone but that doesn’t make the description any less true. All of this leaves us where we are today: a rudderless team lead by a man who is, to put it very bluntly, horribly out of form with the bat, looking clueless in the field (even compared MS Dhoni – hardly a great skipper himself!) – as the third session of the first day of the current game ably demonstrated – and increasingly forlorn (as this picture after his dismissal on Friday shows). Also, just to add to the woes, the current wicket keeper (Matt Prior), is also out of form, dropping relatively simply chances, and is, possibly, several games past what should have been the end of his international career. My reading of the current dilemma is that Cook won’t quit (but he’d probably be quite happy right now if he was sacked) whilst the ECB won’t sack him (but would be quite relieved if he quit). However I think there is a solution – one that will kill two birds with one stone. If the ECB won’t sack him then the face-saving answer will be to say that he has picked up an injury and will be unavailable for a month or so thus ruling him out of the rest of the series (first day of the last test is 15th August). Conveniently Essex (Cook’s domestic team) do not have another First Class game until 15th August and certainly wouldn’t miss him in the shorter stuff between now and then. This gives him time to take a complete break from the game and perhaps clear his head. In the meantime, England will need a new skipper and a new opening batsman. Given that nobody in the current side is pushing their captaincy credentials (Ian Bell is a foot soldier, not a leader; Stuart Broad’s attempts to do the T20 job have been poor and James Anderson seems unable to lead the bowling attack for any length of time) the selectors need to look outside of the team. My suggestion would be to select either James Foster or Chris Read. Both captain their counties and both are wicket keepers. Pick either of them (I’d prefer Foster but I am biased**), tell them that the job is theirs come what may until the end of the 2015/16 season just so long as they get the players functioning as a unit and take that time to identify where the leadership group amongst the current (or near-future) group of players is. Add in an opener (Carberry or Compton probably) and then see how it goes. A new spearhead will be needed to replace Anderson (probably after Ashes 2015) and there is the lingering problem of a spinner but those are not decisions for the captain. Give the ODI and T20 captaincy to Eoin Morgan (he’s unlikely to figure in the test side again) and tell Broad to pick no more than two formats (hopefully Tests only) to play. In the meantime Cook can, if he wants, return to Essex colours for some of their last 4 First Class games this season. If he starts scoring runs then consider him for the 2014/15 season. If not then he gets a winter off and starts again in 2015 and gets picked for England (as a batsman only) when he is back in nick and scoring without difficulty domestically. * A stupidly timed series that owes everything to the ECB chasing money. A more sensible approach to ensuring that the away (for the English) Ashes series doesn’t fall in the same season as the Cricket World Cup would have been to push the away series back a year rather than bringing it forward a year. The end result of this is that there will be 3 Ashes series in 2 years. ** Foster on test duty allows Ben Foakes to keep wicket regularly for Essex thus keeping him with the county before he wanders off like Adam Wheater did and we end up scrabbling for a new ‘keeper once Foster retires.